Catholic Boy closed out his 2017 campaign with a win in the Grade 2 Remsen at Aqueduct. Photo by NYRA. Earlier this week, a few minutes before the draw for Saturday’s Grade 1, $1 million Florida Derby, trainer Jonathan Thomas sat by himself in a corner. He wasn’t consulting a condition book. He wasn’t talking to a client. He wasn’t even looking at his phone. He was just… sitting there. Though the Florida Derby was three days away, Thomas had his game face on. Intensity, thoughtfulness, concentration combined with a calm equanimity; if his eyes had been closed, one might have assumed that he was meditating. 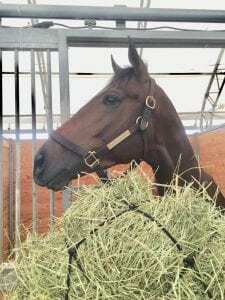 On Saturday, Thomas, 37, will saddle Catholic Boy in the Florida Derby, hoping to earn enough qualifying points to run in the Kentucky Derby on May 6. The bay colt sits at #24 on the Derby points leaderboard with 14 points; a third-place finish with its 20 points might be enough to get him in. A 100-point win or 40-point runner-up position would ensure it. First, though, is the draw, and Thomas was hoping for an inside post in the nine-horse field. It’s Holy Week in the Christian faith, and tonight, Jews will observe the first night of Passover. Thomas’ comments lack any overtly religious insinuation, yet in them, and in Thomas’ life and career, one might hear an echo of the words of the Reinhold Niebuhr prayer about serenity, courage, and wisdom, especially for the trainer of a horse called Catholic Boy that will be running on Holy Saturday, the day before the most important day on the Christian calendar. J. D. Thomas subsequently served as track superintendent at Colonial Downs, where his responsibilities included maintaining the track’s lush and renowned turf course. Perhaps inevitably, Thomas became a jockey, riding in steeplechase races, winning the Grade 3 Century BMW Block House Hurdle Handicap and the Grade 2 National Hunt Cup Hurdle Handicap in 2000. He remembers the beauty of riding in the jump races at Montpelier, James Madison’s home, though noting that the grounds looked a little different from the saddle. Late in 2000, the year of his greatest success as a jockey, he also suffered his greatest setback, when a fall during a race resulted in a catastrophic spinal injury left him unable to walk, much less ride horses. Against the odds, Thomas regained the use of his legs and is now fully mobile. But with riding no longer being an option, he turned to training, working for Christophe Clement before moving to Saudi Arabia to work for King Abdullah. As Pletcher’s New York assistant, he oversaw the horses at Belmont Park while Pletcher moved south to Florida for the winter and north to Saratoga for the summer. He was often the public face of Pletcher’s New York operation, doing numerous winner’s circle interviews during long, cold Aqueduct winters. Perhaps unsurprisingly, when he moved on from Pletcher, he re-located to Florida, training horses at Ocala’s Bridlewood Farm, always with an eye on training his own string, and aware of the gaps in his experience. Catholic Boy. Photo by Teresa Genaro. Studying is one thing; applying knowledge is another. If Thomas’ eye for horses were to be graded, he’d be earning an A, and not only for effort. John Panagot is the racing manager for Robert LaPenta, who purchased Catholic Boy for $170,000 after the son of More Than Ready was an RNA at the 2016 Keeneland January sale. He and Thomas became friendly when Panagot was working for Graham Motion and Thomas was with Pletcher, and in 2015, LaPenta and Bridlewood teamed up with Eclipse Thoroughbreds to purchase a yearling for $1.2 million at the Fasig-Tipton Saratoga Sale. Named Tapwrit, he won the Belmont two years later. Panagot asked Thomas to let him know if he saw anything at that January sale. On August 30, Thomas got his first graded stakes win as a trainer when Catholic Boy won the Grade 3 With Anticipation at Saratoga. 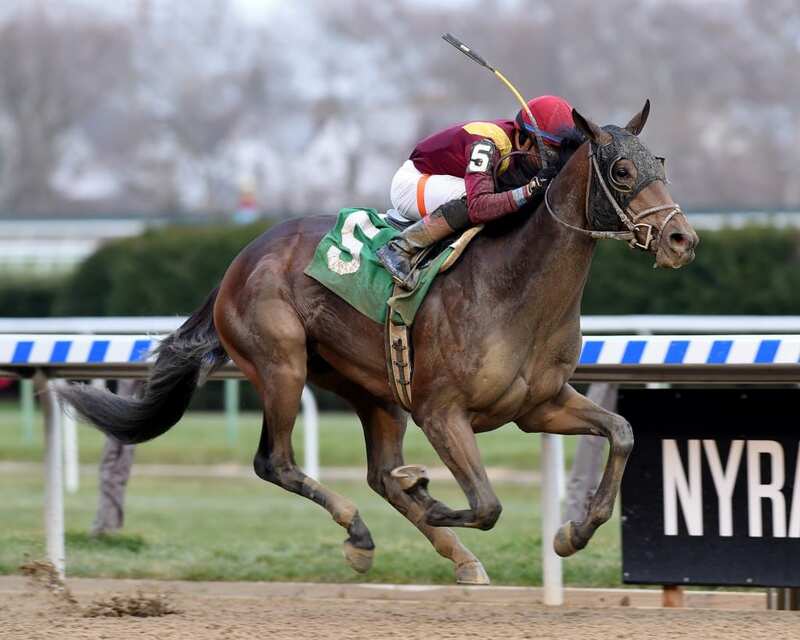 After a fourth-place finish in the Grade 1 Breeders’ Cup Juvenile Turf, the team switched him to dirt, and Thomas got his second graded stakes win—along with Kentucky Derby points—when Catholic Boy won the Grade 2 Remsen at Aqueduct by 4 3/4 lengths. After a freshening at Bridlewood, he shipped to Tampa Bay Downs and just missed in the Grade 3 Sam F. Davis, earning four more Derby points. Thomas hopes he’ll add significantly to his total on Saturday. When Catholic Boy’s post position was drawn, Thomas didn’t get quite what he wished for, but he put a good face on it when asked how he felt about the six hole. With 200 horses under his care and 40 targeting races, Thomas’ training career is more than OK. He has a handful of owners with big stables, cutting down on the management end of the business, leaving him more time to spend with his horses, though his former employer and mentor praised his off-track skills as warmly as his on-track ability. Religious imagery is not exactly unknown in the racing business. There’s talk of racing gods, and not uncommonly, jockeys will make the sign of the cross as they head to the track or enter the winner’s circle. Owner Robert LaPenta is a graduate of Iona College, founded by Christian Brothers in the tradition of American Catholic education. And his racing colors are the maroon and gold of his alma mater. The faithful may well ignore Catholic Boy on Easter weekend at their peril. And perhaps unconsciously, Thomas invokes the sacred as he talks about where he’s been, where he is, and where he’s going.